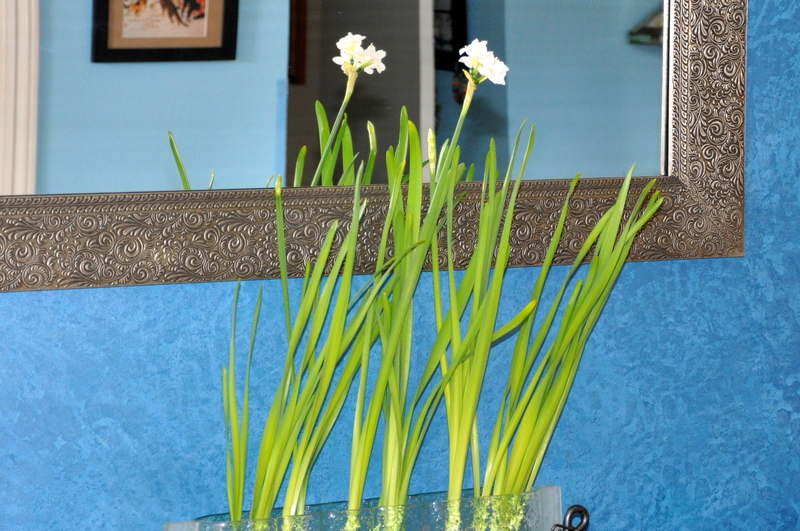 A few of the paperwhite bulbs I planted indoors are in bloom, and they are fragrant beyond belief. It was the first thing I noticed when I opened my eyes this morning. Just one of the bulbs in our bedroom has flowered so far, but the intoxicating scent fills the room. 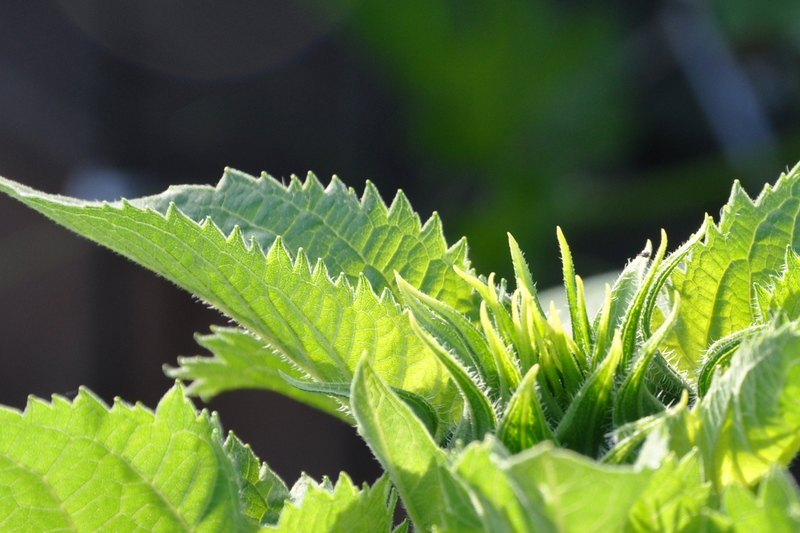 I can see a few buds on the other plants, so I’m in for a sensory treat later in the week. Out in the kitchen, the scent greeted me again. If I were a bird or a bee, the message would be clear: I’m irresistible! That’s why my Latin name is Narcissus. The single bloom in my little pink planter makes me giggle. It seems improbable that the long, lean stem could remain upright, but so far, so good. I will definitely be planting more of these indoors in the future. It’s been a splendid treat. How about you? 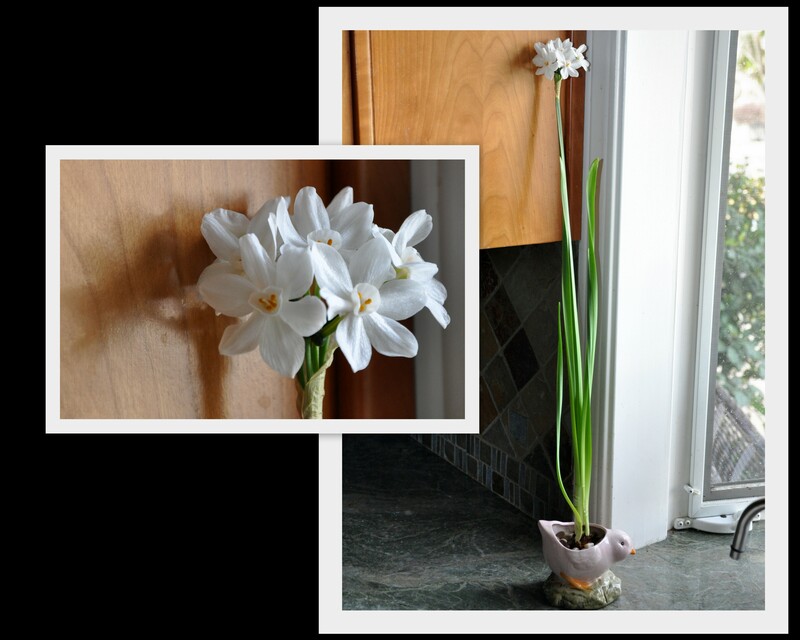 Do you ever grow bulbs indoors? 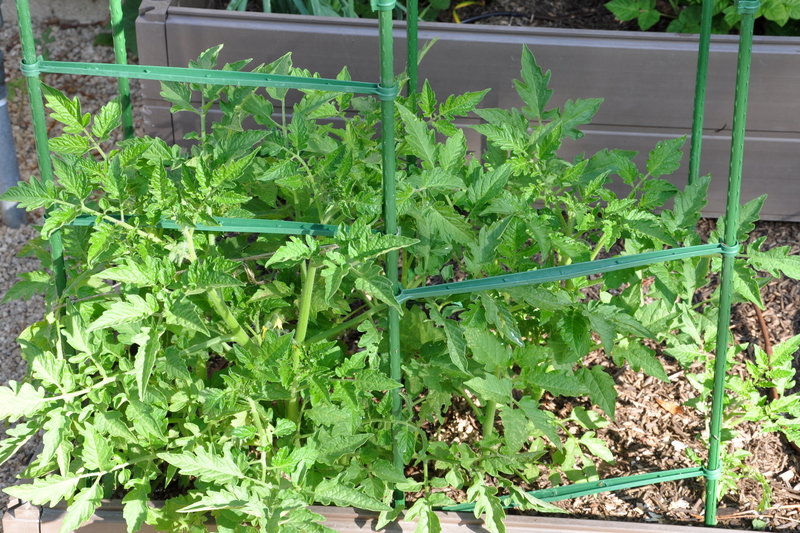 If you’ve been following along, you know that I didn’t plant a single tomato plant this year. Hard to believe, eh? 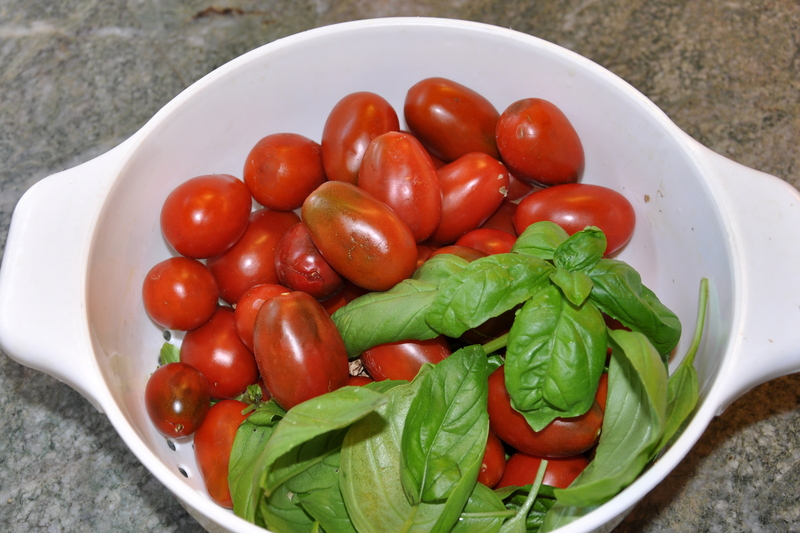 Last year my friend Doug gave me several varieties of Baker Creek Heirloom tomato seeds. I planted them in my City Picker but they were slow to grow. 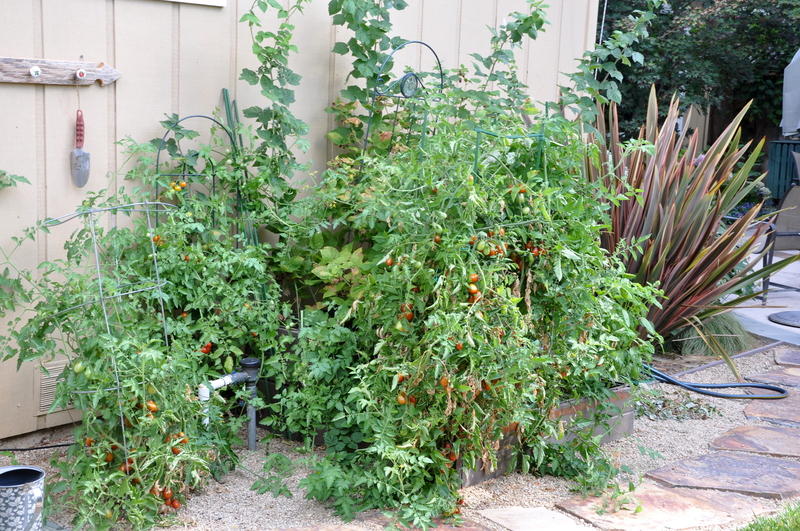 I hedged my bets with an organic nursery plant and finished off the summer with tomatoes to spare. This year the heirloom tomatoes self-seeded one box over. 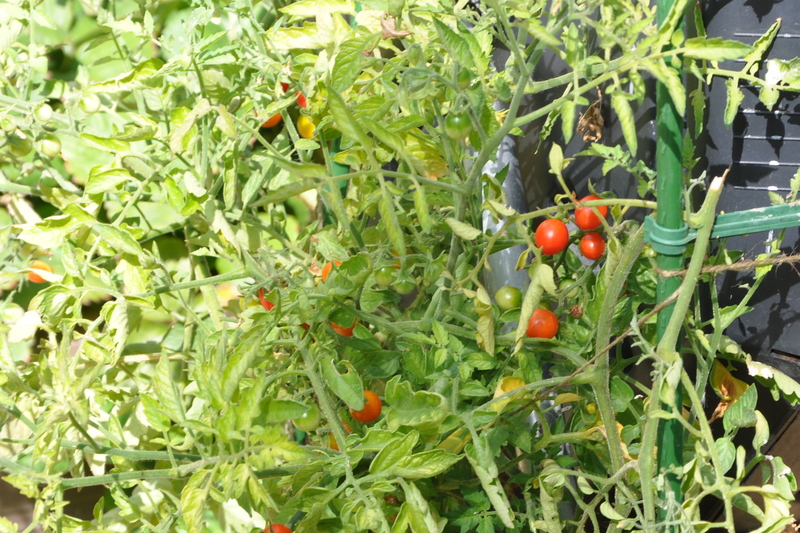 Further, a variety of tiny cherry tomatoes flourished out of the bottom of the rotating compost bin. Two additional plants showed up in the gravel walkway, a larger cherry tomato and another heirloom. What a bounty! Since a speck of a tomato seed managed to sprout through a crack in the rotating composter, I felt compelled to let it grow. I staked the plant when it showed signs of surviving the season, and eventually it produced small, bright red fruit, just like you see in the grocery store. 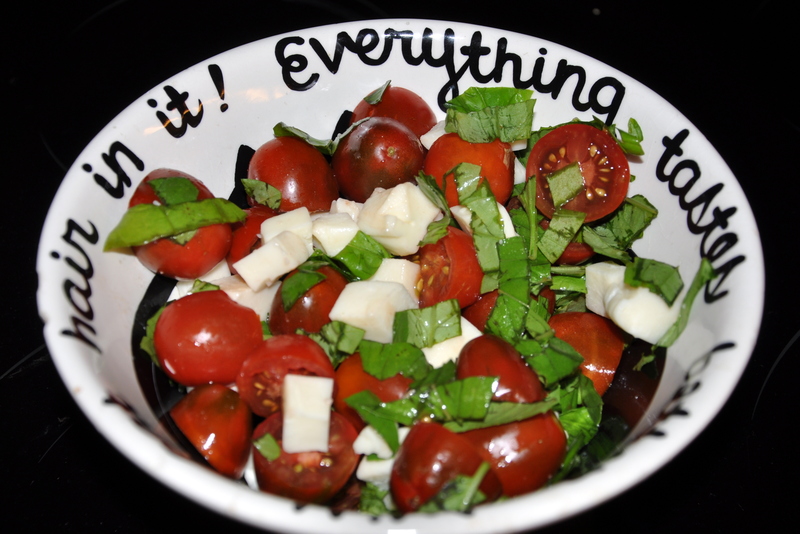 Of course the problem with most tomatoes from the store isn’t the appearance but the taste. These tiny tomatoes are flavorless. What a disappointment. At the back of the garden, leaning up against the house, is another volunteer. 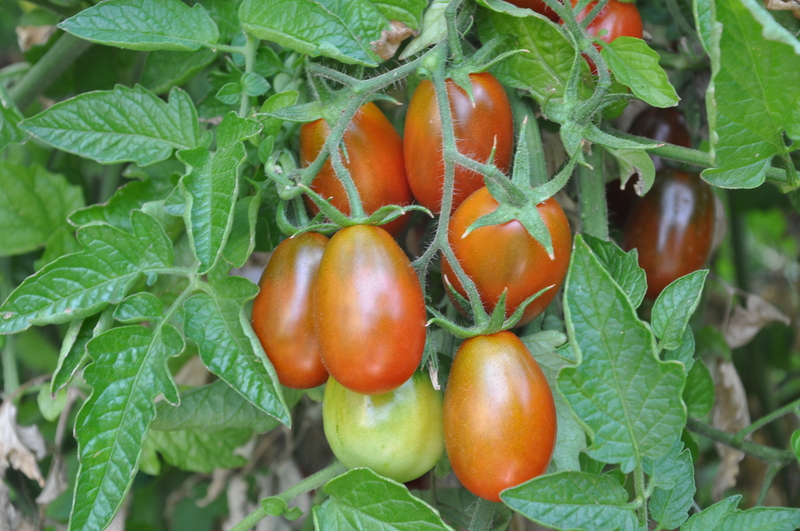 This one produced larger cherry tomatoes, also a brilliant red. They’re a bit sweeter than the tiny cherry, but again bred for appearance and not flavor. Tomato gold! 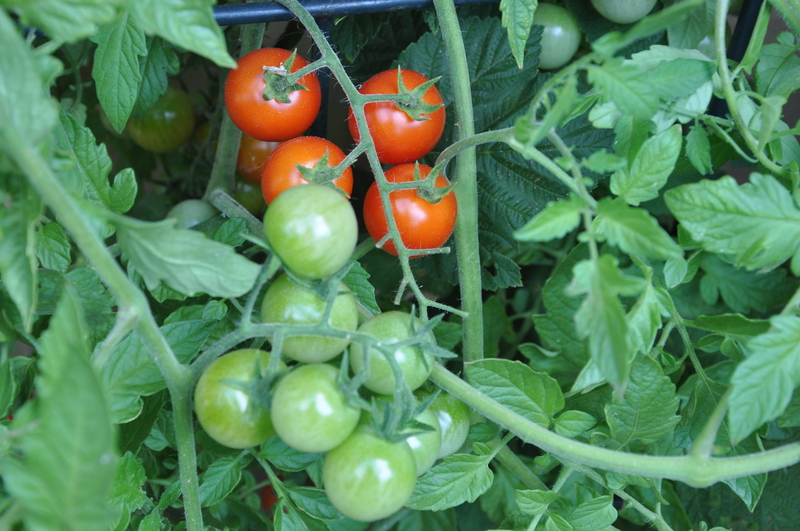 These are the sweetest, juiciest and most prolific tomatoes in the garden. Honestly, there is no turning back once you’ve tasted them. What luck to have an entire crop of these delicious fruits. I sliced open several today for seed saving, but plan to do all my vegetable seed purchasing from them in the future. 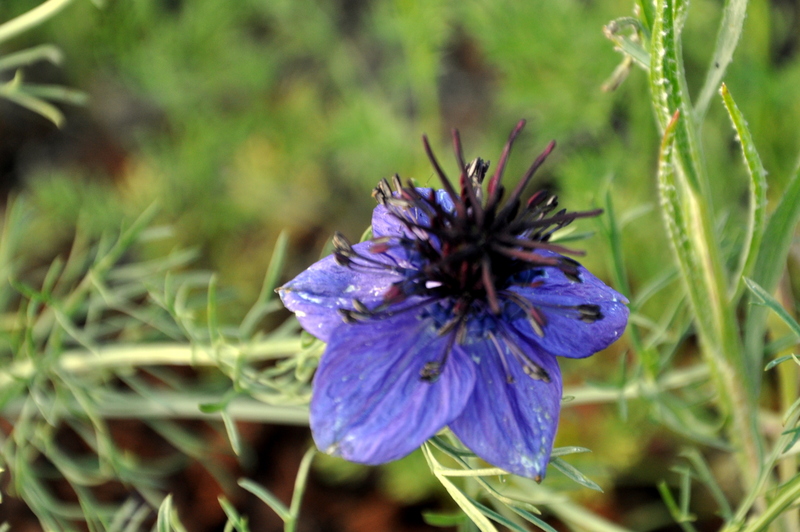 In case you’re interested, check out Rare Seeds Baker Creek Heirloom Seeds. The family works extensively to supply free seeds to many of the world’s poorest countries, as well as here at home in school gardens and other educational projects. It is their goal to educate everyone about a better, safer food supply and fight gene-altered, Frankenfood and the companies that support it. 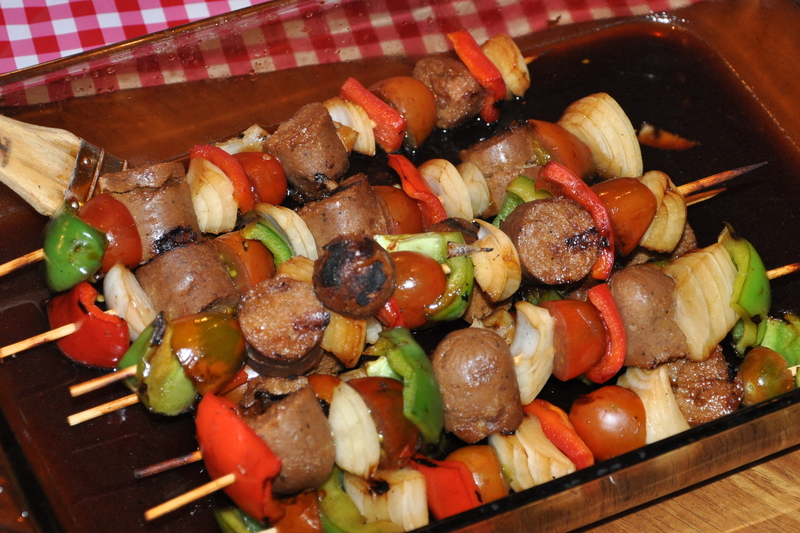 Made with tomatoes, onions, red peppers and vegan Field Roast ‘sausages‘. Eat them straight from the bowl. 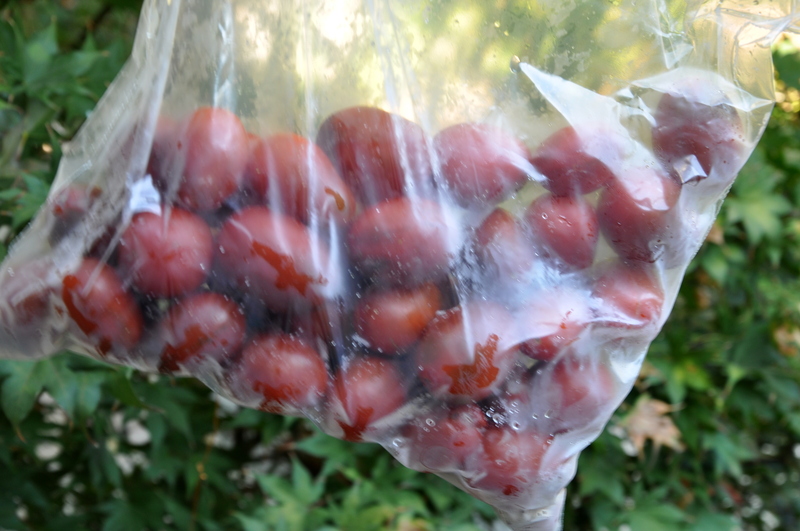 Sarah the Gardener taught me that not only can you freeze tomatoes, but that the skin falls off of them when they’re thawed. Mike made several batches of tasty salsa. Here’s a similar recipe. And of course share with anyone who’s interested. 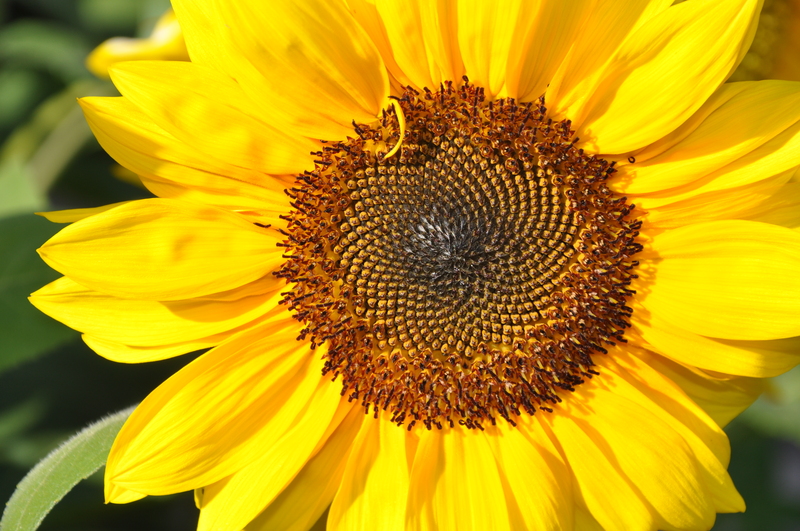 Okay, technically sunflowers don’t smile. The effect is pretty much the same, though. 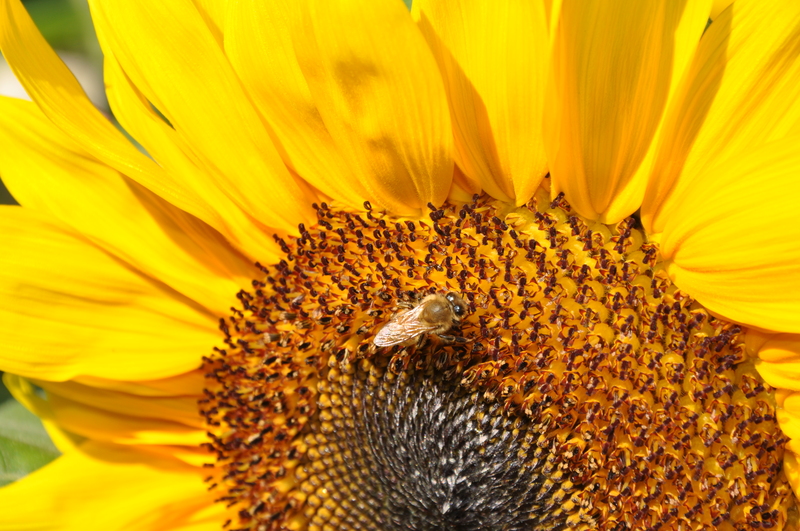 When I look out my window they’re waving in the breeze, nodding their sunny flower heads and vibrating with bees. Maybe I’m the one smiling, but either way it’s contagious. 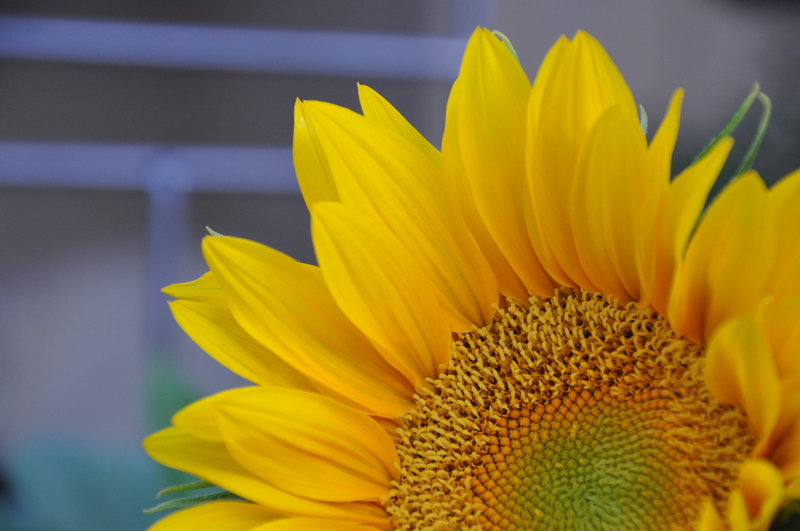 The tallest of the sunflowers is my height: 5’10” or 177 cm. It was the first on the scene. 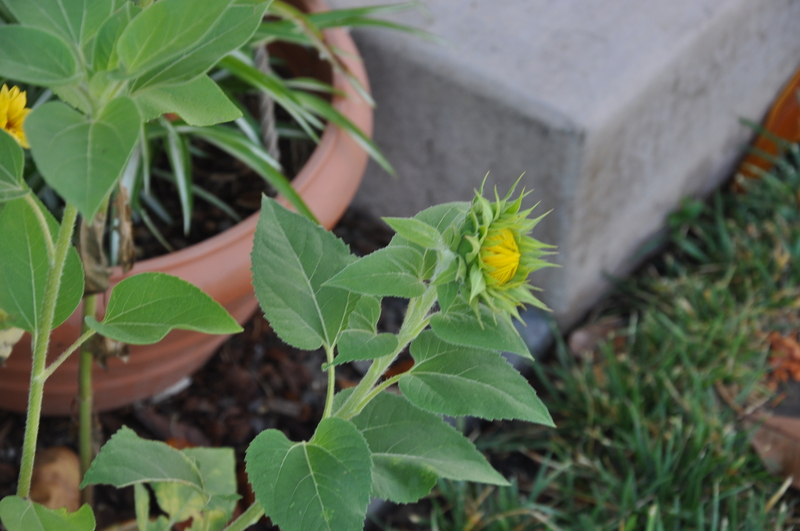 I planted a variety of sunflowers this year, so each one is a bit different. One of the flowers just reaches my knee. 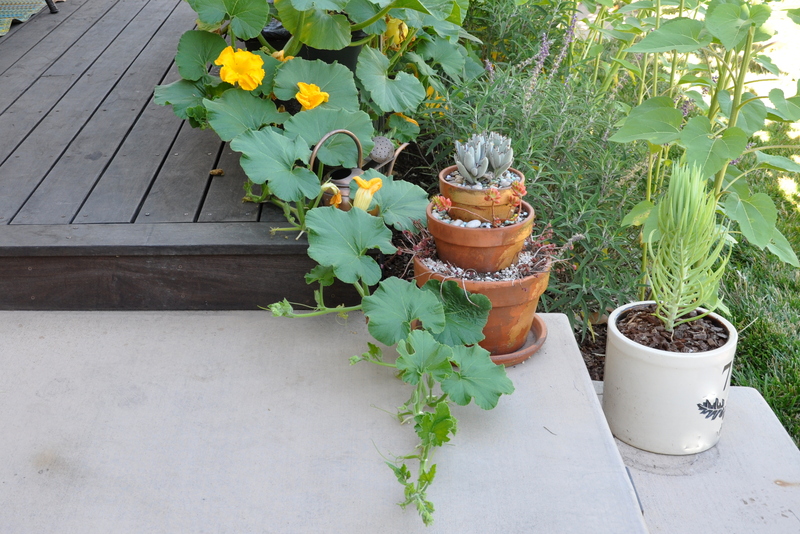 Yesterday I gently untangled a few overzealous pumpkin vines, redirecting them back towards the deck. 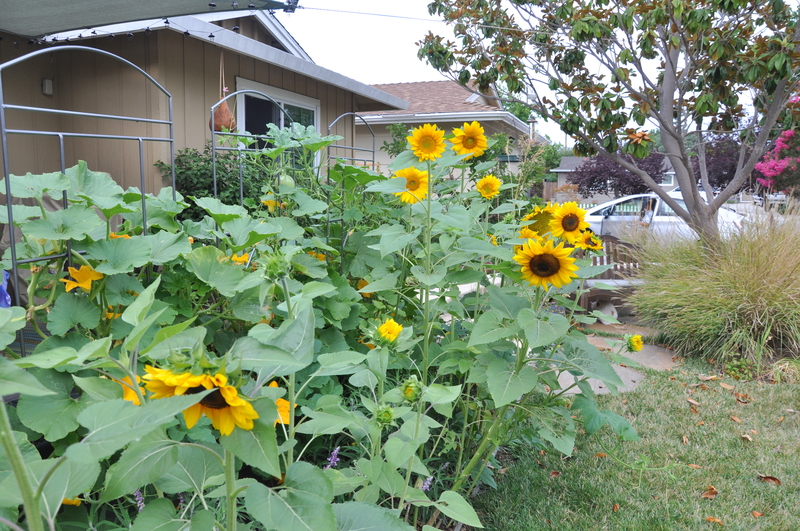 As soon as the sunflowers go to seed, they’ll be overrun by squirrels. I don’t want my furry visitors trampling the pumpkins in their quest. 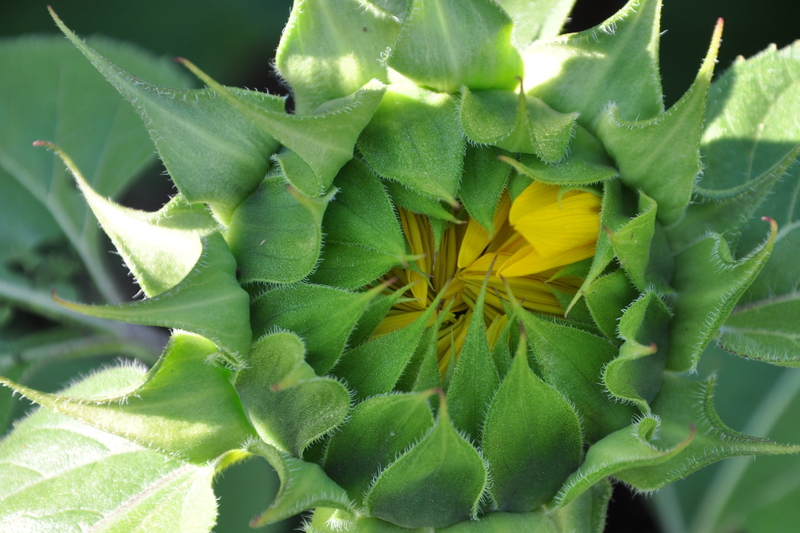 Sunflower stems are sturdy enough to support the heavy seeds. They are not, however meant to withstand the added weight of a squirrel running up and down at snack time. 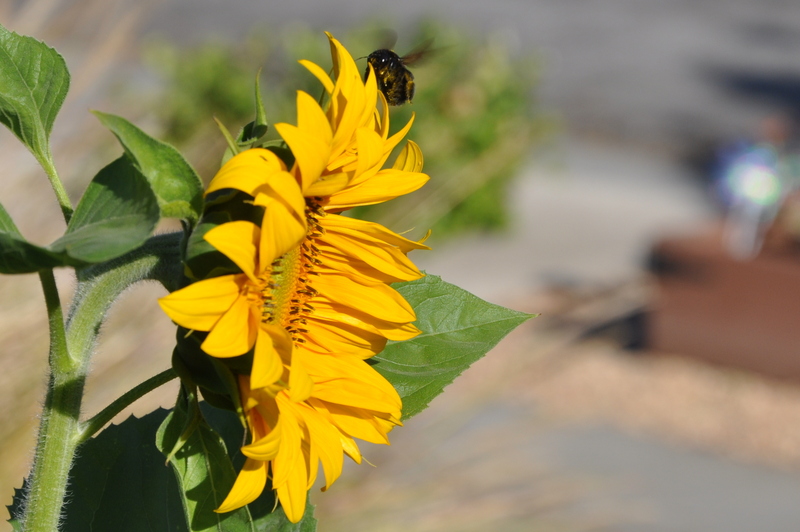 The Fukushima Sunflower project is now following the lead of Chernobyl, and fields of sunflowers are bursting into bloom across this contaminated area of Japan. Volunteers, farmers, and officials planted the flowers so that they can absorb the radiation that leaked into the soil from the region’s damaged nuclear power plant. There are concerns that the contamination is mainly in the topsoil and that the roots of the flowers are too deep to absorb it. Time will tell whether this project will be a success. Officials are hoping that the local economy will benefit as much from the project as the environment. 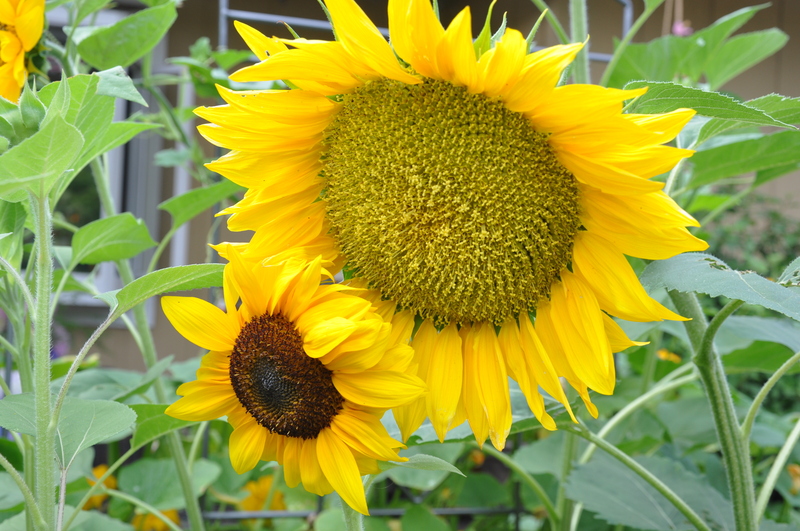 They are hoping tourists will come back to the region to admire the sunflower fields. Due to this magnificent flower’s ability to assist in getting rid of nuclear waste, it has become the international symbol of nuclear disarmament. I’m smiling. How about you? Pumpkins grow like weeds. That’s a good thing. 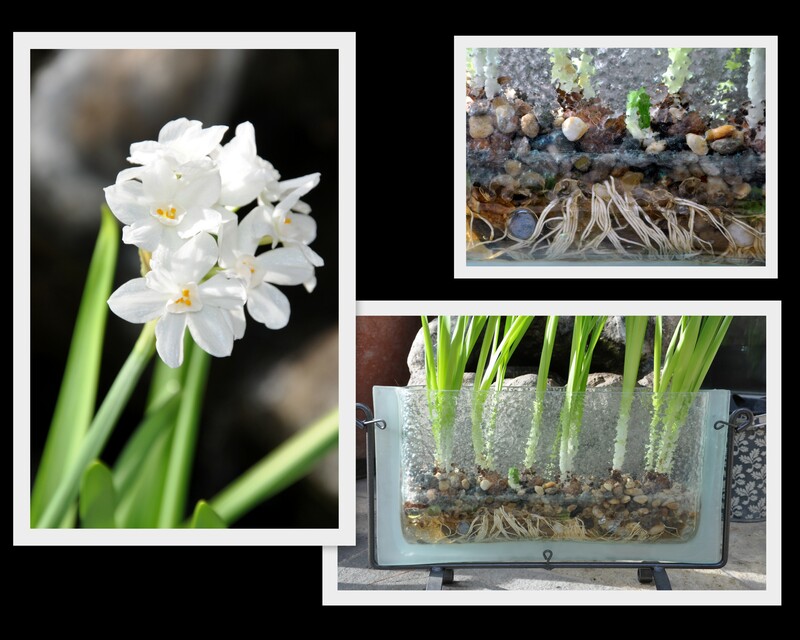 Within days of planting, flat, white seeds crack under the warm soil and sprout. Cotyledons give way to true leaves and off they go. Leaves and stems shoot up so quickly that if you stood still awhile, I’m sure you could see them grow. I’m a fan of every stage. The size of the leaf is a good indicator of the size of the fruit to come.True leaves are prickly and so are the stems, which are hollow. They remind me of large, green drinking straws. Stems and leaves lead you to think you have a small shrub on your hands, but then strong, curling tendrils appear and the plant takes off down the garden path, up the trellis and around the bend. A decade ago, before we knew a thing about growing pumpkins, a self-seeded vine grew across the path, into a garden bench, and out the other side. It eventually set fruit, a lovely, heart-shaped pumpkin that hung from the garden bench door. We left the door open the rest of the season, delighted at the rambling pattern and the speed at which it grew. My boys were 3 and 6 that year, so you can imagine the daily joy of discovery. We headed out back in those early fall days to see what those pumpkins were up to. It’s been such a pleasure growing this year’s crop in EarthBoxes™. They’re right outside my kitchen window, so I see them several times a day. 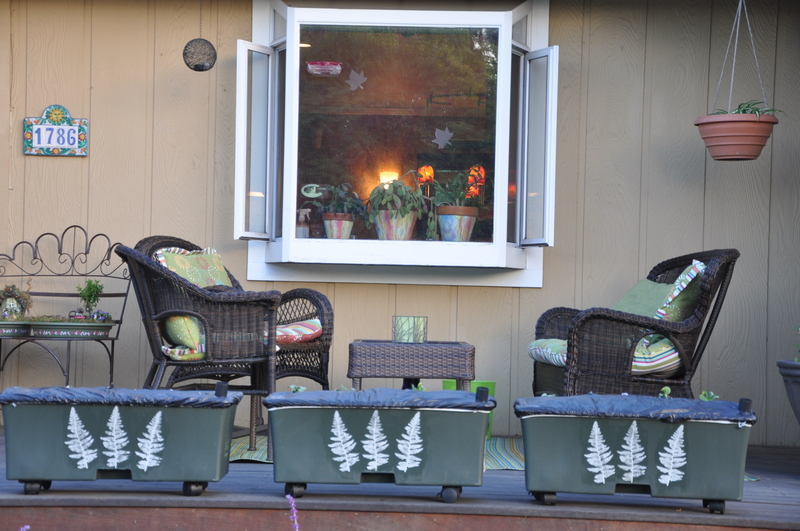 We sit on the deck in the evenings and on weekends, and now feel like we have a ‘fourth wall’ on deck. 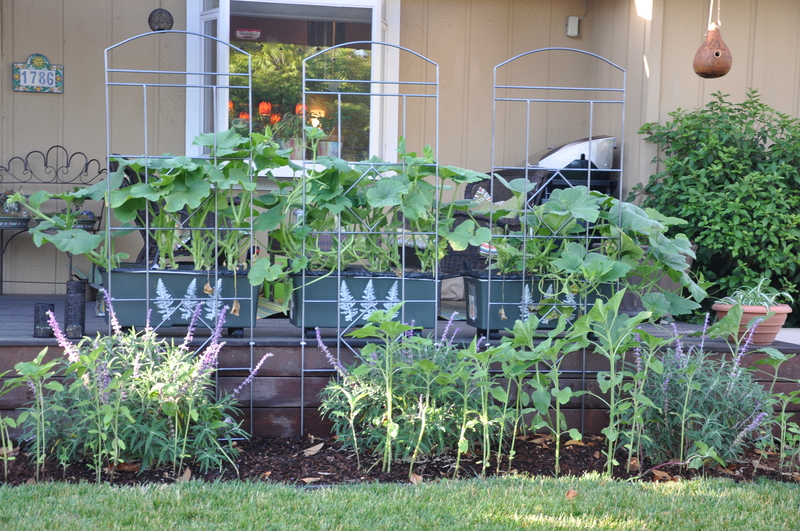 The pumpkins and sunflowers together formed a beautiful screen. Here’s a look at their progress since early May. 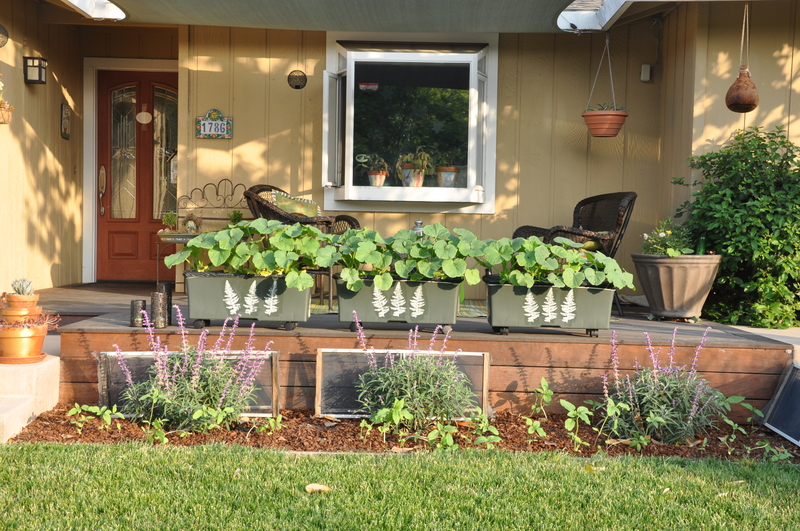 My stenciled EarthBoxes™ planted with three types of seeds: an assortment of saved seeds from last year (the mystery box) along with Botanical Interests ‘Jack-o’-lanterns’ and ‘Luminas’. Hearty seedlings in just one week. About thirty days in, and look at them grow. 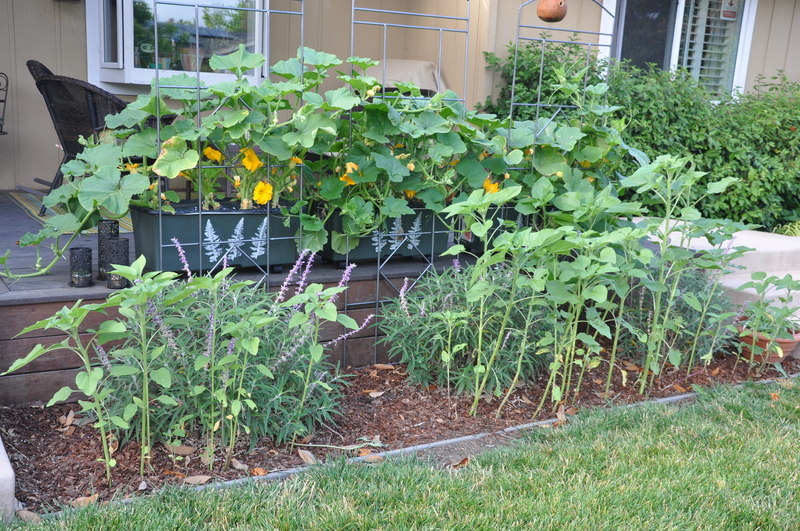 You can see the start of the sunflowers near the lawn, also started from seed. I’ll write more about them later this week. I added trellises to allow the vines to grow up as well as out. The birds land there, before diving in to the sunflower leaves. 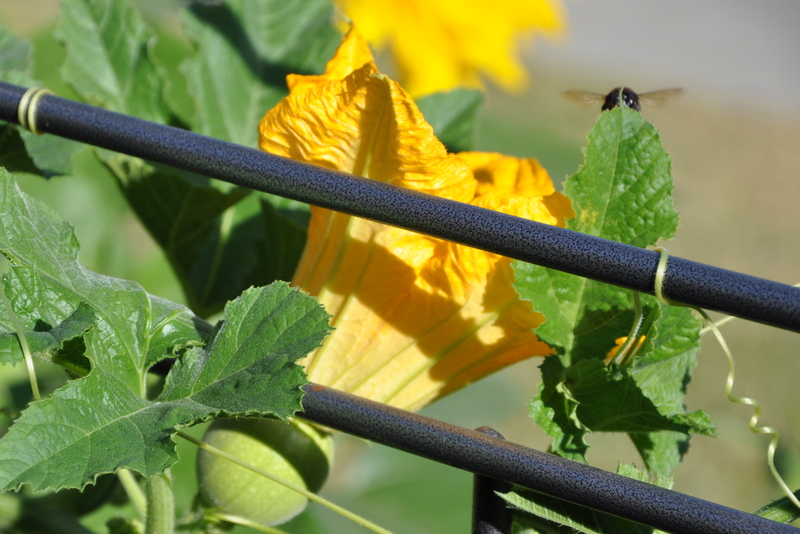 Why won’t they eat the squash bugs instead? Golden flowers attract bees and wasps. I love spending time out there in the morning before the heat descends. It’s a challenge photographing the bees. They move in and out of the flowers with speed and efficiency. I still try though. I have about 75 blurred photos, but I refuse to give up. 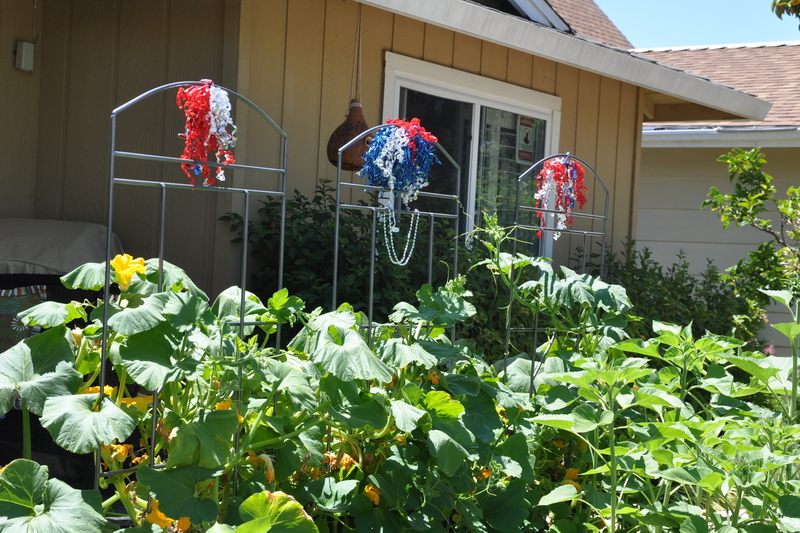 The vines got a bit of window dressing for Independence Day. They’re beautiful on their own, but a little red, white and blue called attention to their magnificence. They’re wilting in the heat in this picture, but a long drink after dusk set things right. At the risk of stating the obvious, I love growing pumpkins. Thank you for following along with my gardening obsession. I love my pumpkins. After a good night’s rest I’ve decided that I won’t take it lying down. 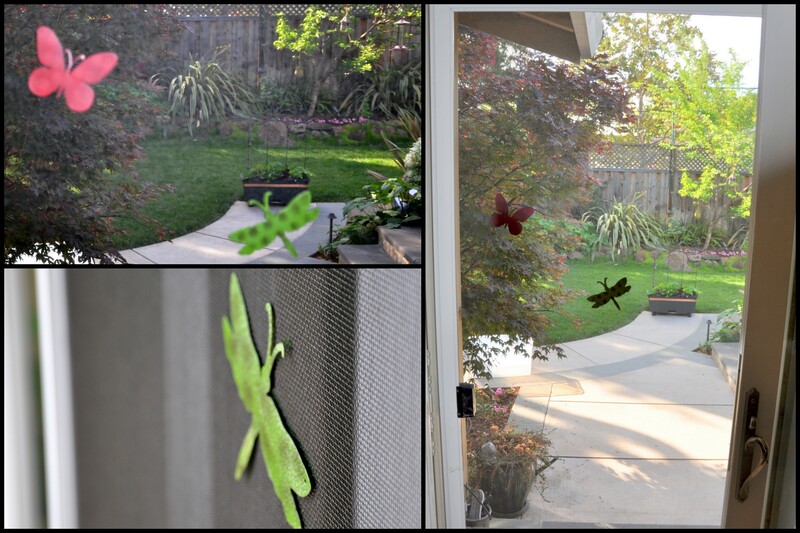 In case you missed yesterday’s post, my nemesis the squash bug recently moved in. You can catch up here. Actually I did take one thing lying down: pictures. 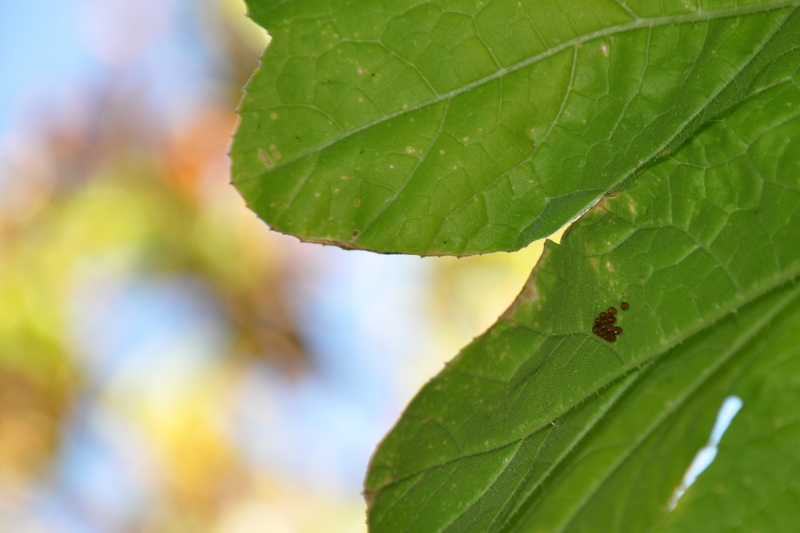 How else would I get a shot of the underside of the leaf and the attached eggs? I laid flat on my back and took photos looking up. Fortunately, no one walked by at the time or they surely would have called the paramedics. Amazingly, I managed to get back up, then spent the better part of an hour looking at the underside of every leaf on the pumpkin vines. 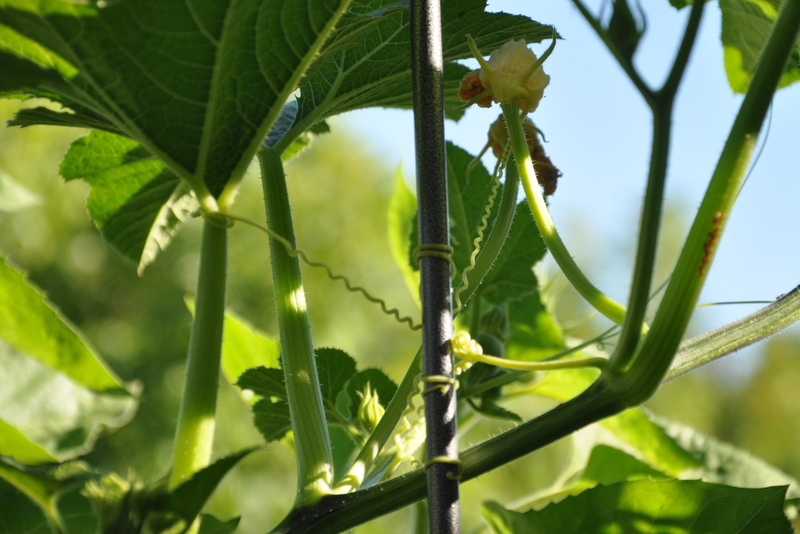 That scrutiny lead to another discovery: eggs on some of the pumpkin plant stems. 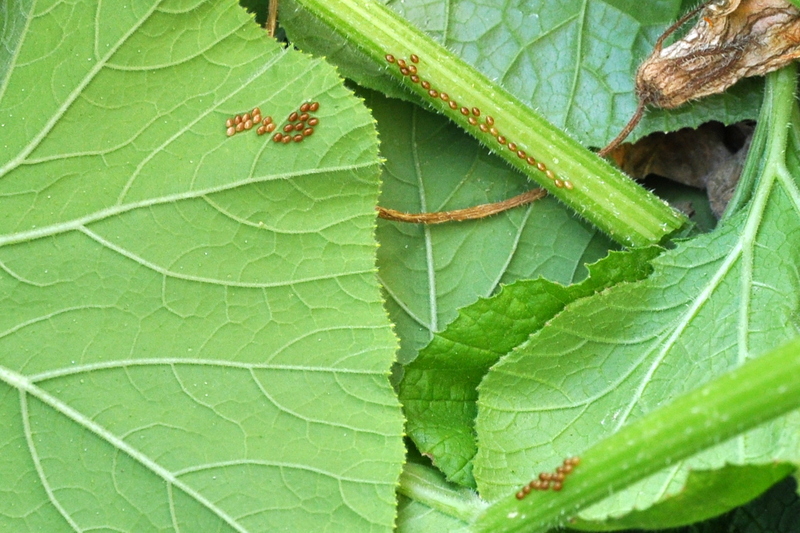 In the end I’d scooped several adult bugs into my dry bucket, along with infested leaves and stems. I removed dead or browning leaves as well as spent flowers, making it easier to detect the adult bugs They were happy to crawl on my glove and from there they went into a bucket. I dumped the infested leaves and bugs into the curb side green waste site, and within an hour the ‘green monster’ came by and scooped the entire pile into the back of the truck. 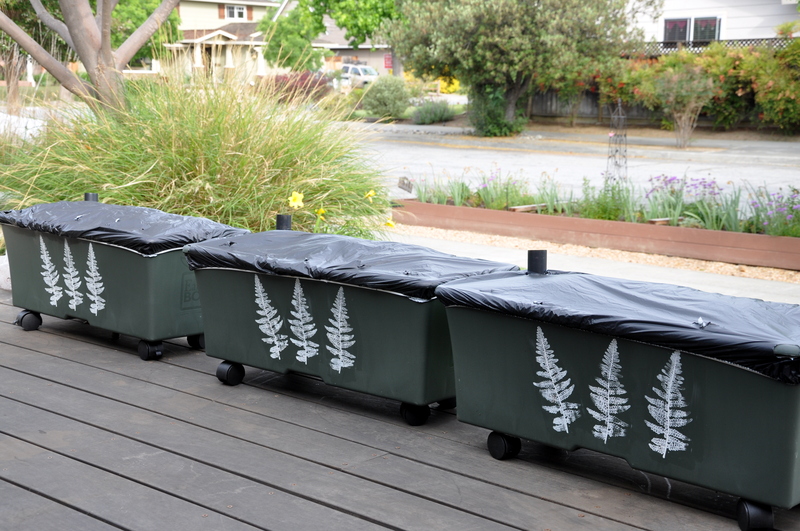 This was another tip from one of the sites: rip them out and compost them. The lovely Pauline at The Contented Crafter looked up companion plantings for me, something I hadn’t thought of nor come across in my reading. Ah, the web is vast indeed. There is enough room in the boxes for additional plantings so I’ll give it a try. Nasturtiums unfortunately need opposing growing conditions, but dill might work. I’m going to look for some at the garden center. It’s unlikely that I removed all the eggs this morning. I’m pretty sure others still lurk on the vine. With daily checks, however, I hope to slow them down and possibly keep them at bay. Pauline noted that ‘every garden needs a bit of mystery’ but for now I’m happy to have this one solved. I posted this photo last week, and asked for help identifying it. Extensive Google searches were no help. 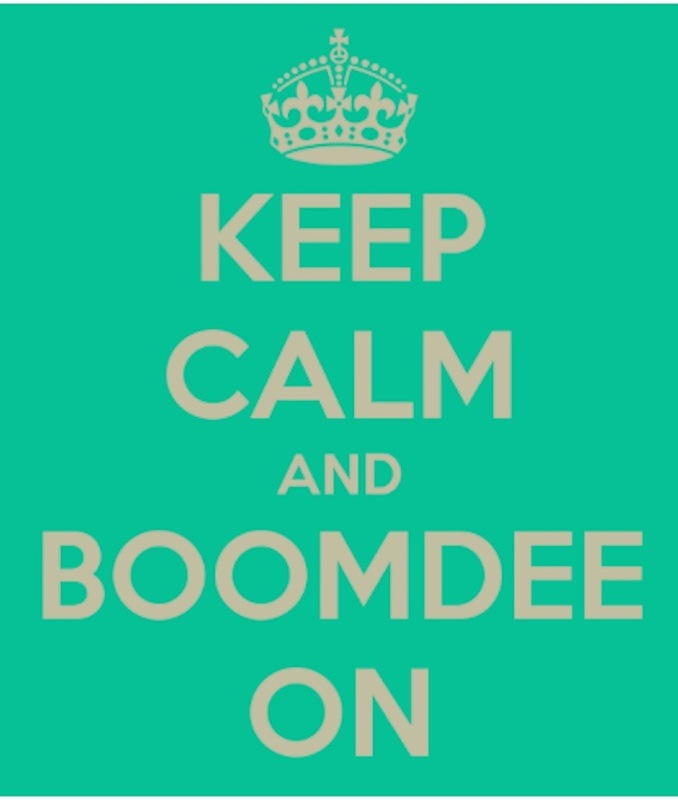 Three cheers for my blogging community! 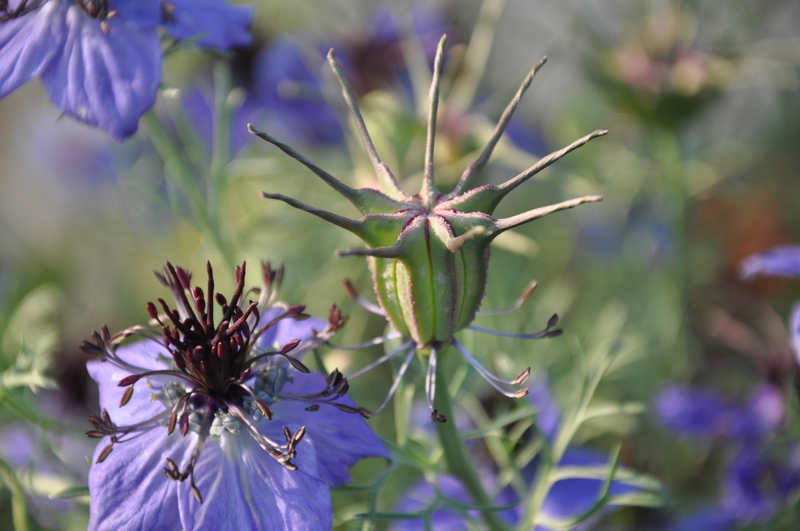 Cathy of Words and Herbs thought it might be ‘Nigella.’ Anne of Anne Lawson suggested ‘love-in-a-mist.’ They’re both right. 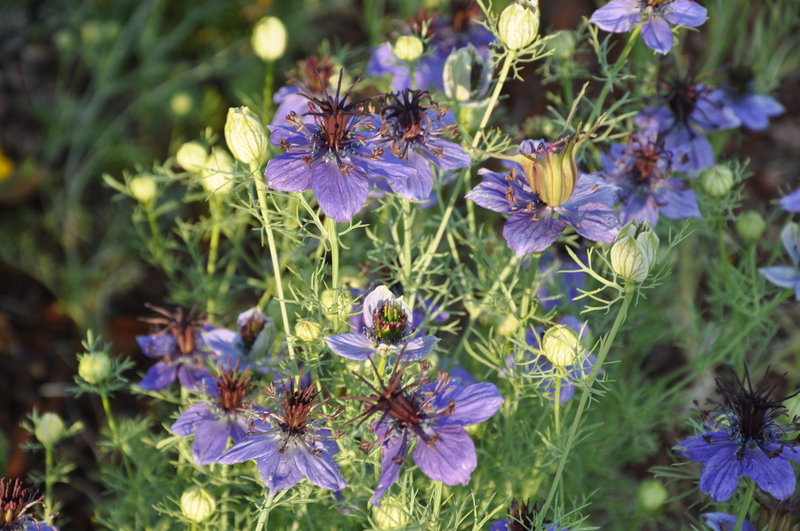 These wonderful, self seeded flowers are Nigella damascena – Love-in-a-Mist. Thank you both. Over the weekend I sampled a delicious avocado cupcake at Sunset Celebration Weekend. I meant to share it with you yesterday. The cupcake and the frosting both contain avocados as a healthy fat alternative. You can download the recipe at the California Avocado Commission. Please let me know if you give them a try. If you’re looking for a screen saver for your tablet or PC, I’m afraid you’ve come to the wrong post. If you’re a bit of a klutz like me, however, this post is for you. I’ve walked into our screen door on more than one occasion, with the full force of my being. I’m always completely stunned each time, as if it’s never happened before. Last summer my son’s friend hit the screen with such force that it tore out of its frame. I felt ever so slightly vindicated. His friend wasn’t hurt of course, and they both laughed it off, but our screen has taken a real beating. We’ve had to replace it at least twice in the past several years, and didn’t even bother to repair the current one when the lower corner came loose. The cats immediately claimed it as their own. After the most recent screen crash, my husband applied a strip of black electrical tape at eye level and called it a day. Though lacking in aesthetics, it was a brilliant idea. It worked. They’re mirrored magnets. You place one on the inside of the screen and attach the mirrored magnet to the outside. I think they’re fun in a kitschy sort of way and they get the job done. 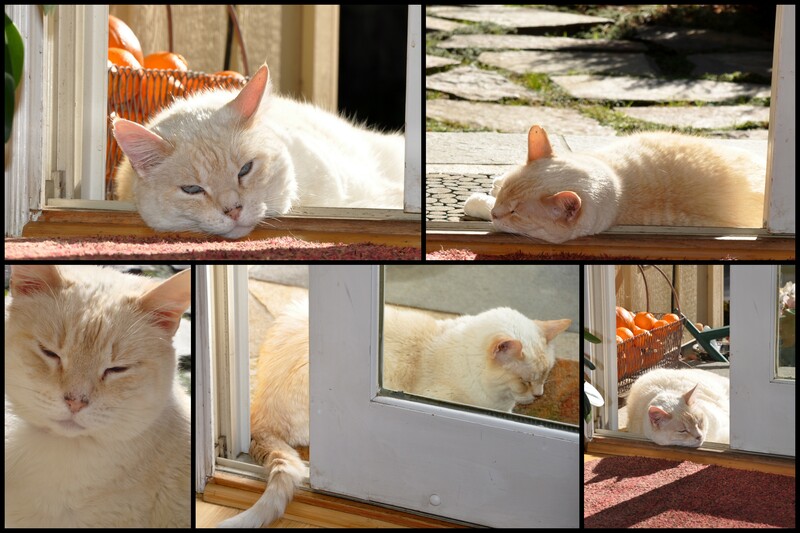 Have you every walked through a screen door? You can tell me. I promise not to share it with anyone other than the internet.